It's the first Friday of Lent! As promised, I'm bringing back Meatless Fridays wherein I'll be sharing meat-free recipes every Friday during the 40-day period of Lent. This is my way of helping those who are trying to abstain from eating meat (beef, pork & poultry) as a form of sacrifice during the Lenten Season. 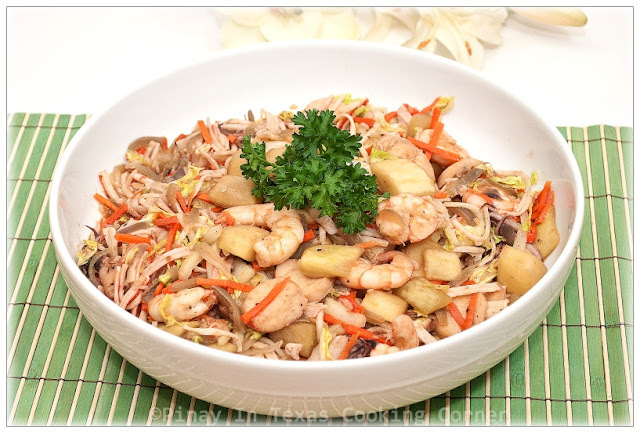 Today, I'm sharing with you a very easy and flexible recipe which I call Seafood and Vegetable Medley in Oyster Sauce. For this, I just made use of some veggies and seafood that I have in the refrigerator which I simply sauteed in garlic and seasoned with oyster sauce. For the vegetables, I used Napa cabbage, bottle gourd and carrots...but regular cabbage, celery, chayote and green beans will also work well. For the seafood, you can use clams, mussels, scallops, as well as fish and shrimp balls in addition or as replacement for the shrimps, squid, crab sticks and squid balls that I used. This is a very simple and quick recipe but really healthy and delicious! You should try it! 1. In a saucepan over medium heat, saute garlic in olive oil until light brown. 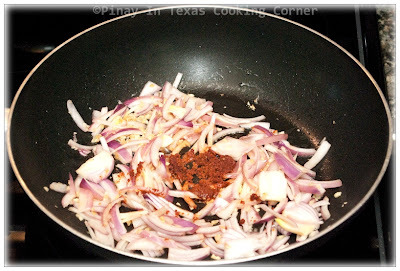 Add onions & shrimp cube. 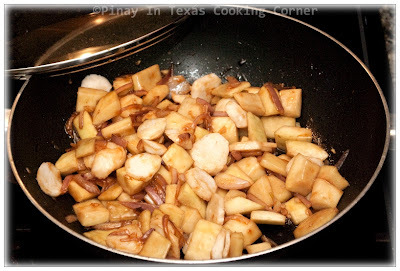 Saute until shrimp cube is melted. 2. Add upo and squid balls. Saute for about 2 minutes. Add 3 Tbsp oyster sauce. Mix well. Cover and simmer for about 3 minutes or until upo is almost cooked. 3. Add shrimps, squid, stalk part of napa cabbage and carrots. Season with salt and pepper to suit your taste. Stir until well combined. Simmer while stirring occasionally for about 3 minutes or until shrimps and squid are cooked. 4. Add crab sticks and leaf part of napa cabbage. Mix well with other ingredients. Add remaining oyster sauce. Simmer for another minute. 5. Remove from heat. 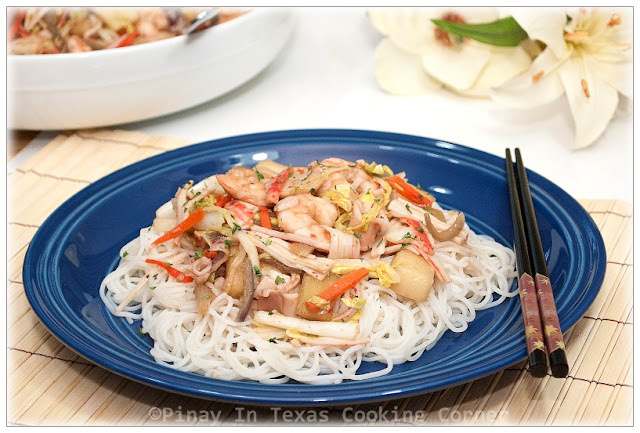 Serve with hot rice or freshly cooked Jiangxi vermicelli. Is that mee hoon you have paired everything you have added into oyster sauce??? goodness my kind of Asian food which we enjoy all the time. yum to that Tina. Btw, for us when referred to Lent and god, no meat including not even seafood and only veg, so its more challenging being only vegetarian. This looks amazing with all my favorite flavors. I pinned and bookmarked this to try soon. Thanks! Have a great weekend. This one dish meal does look healthy as well as delicious. I do need to stock the pantry with some oyster sauce! I am ready to have some of this dish-great recipe. Enjoy the weekend Tina! You are right - I love it - in all its seafood-laden, vegetable filled simplicity. Noted. I agree with Sarah--your dish looks amazing! Like Tina, I should stock my pantry with oyster sauce as well. I buy it once in a while, but if I had some on hand right now, I could replicate your dish. Kudos! Oh, how delicious, Tina! I made shrimp scampi tonight, but your medley will be great for another Friday! Oh yes, Nami! Soy sauce and oyster sauce work so well together! 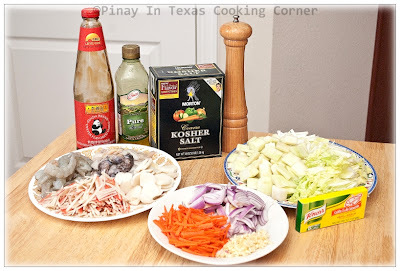 I usually use both in my pancit recipe! Yum! This looks really good! Nice presentation! Healthy and delicious! It would be hard to say no to this one. Oh, it looks so flavorful and beautiful! I love sea food and this dish looks just amazing! 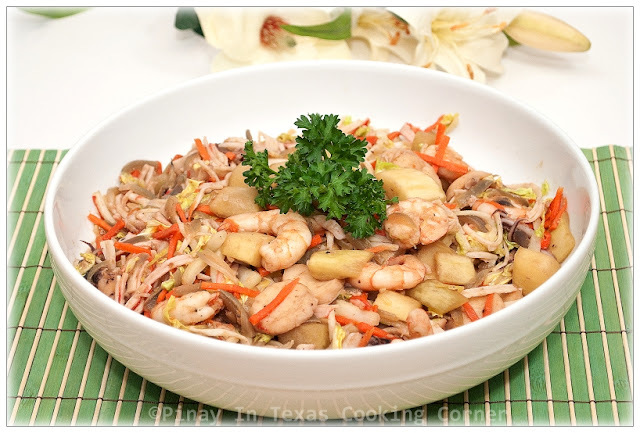 I love seafood and this dish is loaded with flavors Tina! This sounds delicious and healthy. Brilliant recipe! I bookmarked this one for a later date to make!! Now, this is a medley of great flavors and I'm it's fun to eat! Nice photo, Tina! I'd like some please. Thanks. lol! Your photos always make me so hungry, Tina. This, as usual, looks so tasty!